A High Reliability Organization (HRO) is an organization that has succeeded in avoiding catastrophes in an environment where normal accidents are expected due to risk factors and complexity. A NORMAL ACCIDENT or SYSTEM ACCIDENT is an “unanticipated interaction of multiple failures in a complex system. So what does this have to do with emergency medicine? First a story…. A patient suddenly becomes unresponsive and apneic shortly after extubation following a normal diagnostic workup in the emergency department of a trauma center (not mine). He requires emergent reintubation for a short period of time before he wakes up and begins to breath spontaneously. Hospital policy of properly labeling unmarked meds not routinely followed. Teams performing intubations did not routinely ensure\witness proper disposal of dangerous medications. Prepackaged flushes not routinely available so normal saline drawn into 10cc syringes also used for medications. In order to flush hep lock the nurse used a syringe of what appeared to be normal saline left at bedside. RESULTS: Patient was unintentionally injected with 60-80mg of Succinylcholine and paralyzed. Hypercomplexity – depend on multi-team systems that must coordinate for safety. Tight coupling – of teams in which the members depend on tasks performed across their team. Extreme hierarchical differentiation – in which roles are clearly differentiated and defined. Intensive coordination efforts are needed to keep members of the teams working cohesively. Multiple decision makers in a complex communication network. High degree of accountability when an error occurs that has severe consequences. Need for frequent, immediate feedback of the conditions and changes occurring. Compressed time constraints – decisions cannot be put off until later. 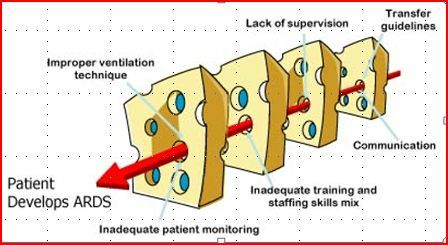 Over the next couple of weeks we will learn from the strengths and failings of other HROs and see what we can apply to emergency medicine. As a preview feel free to download this slide set: HRED. See you next week!